Does life “begin” at 46 because memory decline since 45? 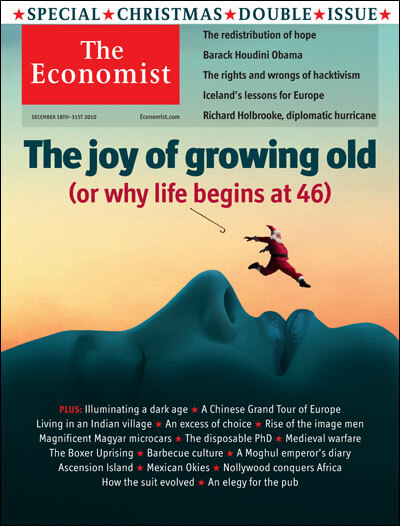 A thought-provoking article about age and happiness featured as cover story of The Economist‘s 2010 Special Christmas Double Issue with the title: “The joy of growing old, or why life begins at 46”. The article explains that life is not a long slow decline from birth to death. It is, rather, a U-bend. People are least happy in their 40s and early 50s, reaching a nadir at a global average of 46. The explanation is far from clear, but chances are the U-bend is the aggregated behaviour of the mix of different emotions that enter into the happiness equation. In a paper titled “A snapshot of the age distribution of psychological well-being in the United States“, Arthur Stone, Joseph Schwartz and Joan Broderick breaks well-being down into positive and negative feelings and looks at how the experience of those emotions varies through life. Enjoyment and happiness dip in middle age, then pick up; stress rises during the early 20s, then falls sharply; worry peaks in middle age, and falls sharply thereafter; anger declines throughout life; sadness rises slightly in middle age, and falls thereafter. And here comes my own hypothesis: maybe the reason why life begins to appear rosier at 46 is decline in brain faculties. If past –our capability to recall it and its influence in our present– was the main reason behind human unhappiness, as we grow older and accumulate more experiences, its weight would laden our happiness, until at the age of 45 when, on average, our memory would begin to weaken and the pull of the past would slowly begin to fade away. Are there any research group out there to test my hypothesis?